HP wants to add augmented reality to its Elite x3 smartphone, and it's looking at Microsoft's HoloLens as one way to do it. The Elite x3, which runs Windows 10 Mobile, was scheduled to ship last month starting at US$699.99 but has been delayed. HP believes the smartphone has the horsepower to be a PC in a pinch. It might also become an AR device that could be used in enterprises. Universal Windows applications made for the HoloLens AR headset will work on smartphones, and they could be used on the Elite x3, said Michael Park, vice president and general manager of mobility at HP. The Elite x3 won't do AR right out of the starting gate, but it will eventually, Park said. "Directionally that's where the roadmap will go," Park said. In AR, floating objects are superimposed on real-world scenarios. That will change the way workers interact with the physical world around them, Park said. The ability to augment real-world scenes could help in areas like medicine and troubleshooting, he said. A challenge for HP will be to figure out how to incorporate AR into the smartphone. AR is available in headsets, like Microsoft's HoloLens, and without a headset, like in Lenovo's upcoming $499 Phab 2 Pro phone, which is based on Google's Tango and can superimpose information and images on its screen. The Phab 2 Pro has special cameras and sensors that can recognize, track and measure objects. The Elite X3 has a powerful Qualcomm graphics processor but lacks the Kinect-like camera that's included in the Phab 2 Pro for object tracking and gesture recognition. However, there are other ways to bring AR to the smartphone. "It could be a head-based unit or arm-based unit combined with the [handset] unit -- there are all kinds of scenarios," Park said. With the Elite X3, HP is re-entering the smartphone market, where the company has failed previously. HP quit smartphones in 2010 after its ill-fated acquisition of Palm, later selling off the remains of that company in 2014. Park said it was a tough decision for HP to get back into smartphones but the company couldn't ignore them because they're important work tools. For now, HP is exclusively using Windows 10 Mobile in enterprise-grade handsets and has no plans to ship low-cost phones. "There are a lot of people in the commercial domain who are not using Pokemon Go," Park said. "We're not trying to hit the volumes and scales of Android. We're going after IT shops." But Windows 10 Mobile is stumbling, and that won't help HP. Shipments of Windows phones were just 2.4 million units in the first quarter of this year, capturing just 0.7 percent of the market, according to Gartner. In the same quarter, Android had 84.1 percent of the market and iPhones made up 14.8 percent. HP's goal with the Elite x3 is to bridge the gap between PCs and smartphones. It is providing services so desktop applications can be used on the smartphone via the cloud. HP will port legacy applications to the Azure or Amazon Web Services cloud, and the apps will then be accessible on the Elite X3 via remote desktop or cloud services. HP will charge a subscription fee for the virtual machine and cloud-based application services, will be broken down into two categories: "essentials," for small and medium-sized businesses that rely heavily on legacy apps, and "premium" for large enterprise customers, which will include app transformation to make the programs cloud ready. The Elite x3 weighs 194 grams and is 7.87 millimeters thick. It has a 16-megapixel rear camera, an 8-megapixel front camera, dual SIM slots, 64GB of storage, 4GB of RAM, 802.11ac Wi-Fi and a microSD slot. The device has biometric authentication features like iris detection and a fingerprint reader. 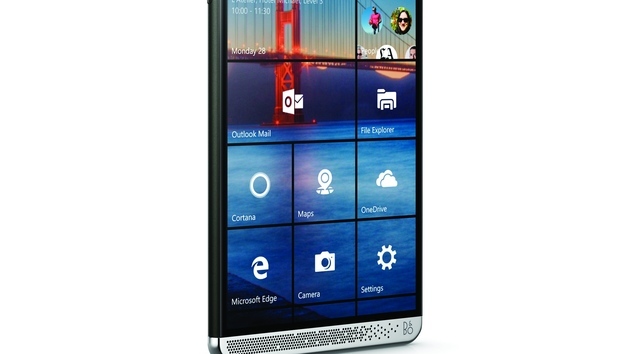 HP's vision of the Elite x3 as a true PC replacement hinges on services, the processor and accessories. The Qualcomm Snapdragon 820 processor in the phone has the processing power of entry-level PC chips, but not of Intel's faster Core PC chips. A Desk Dock allows the Elite X3 to connect to external monitors, input devices, storage and wired networks. The Lap Dock -- which is more like a dumb laptop accessory with a 12.5-inch screen and a full-sized keyboard -- can be hooked up to an Elite x3 wirelessly or through a USB Type-C cable.